Who knew that appropriate sneaker choices would be discussed during this weekend's Confederate flag support rally at Georgia's Stone Mountain Park? 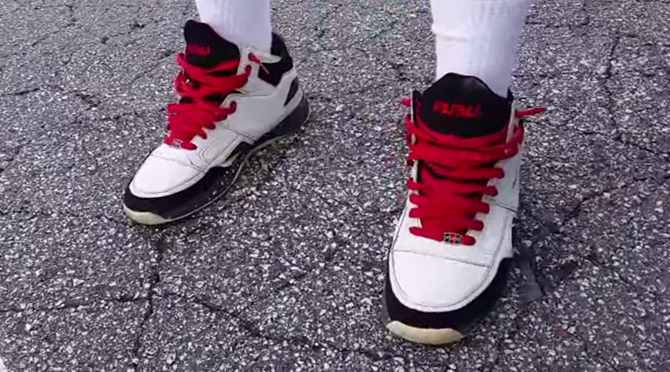 In the video above, taken at the rally, a man with a KKK hat and tattoo is caught wearing FUBU sneakers. In an irony lost on the subject of the video, FUBU of course stands for "For Us By Us," a slogan whose "us" is typically interpreted as referring to African Americans. FUBU was founded in 1992 by Daymond John, an African American. The apparent Klansman is unfazed by the revelation, insisting that, "I don't care if a black man designed my shoes." "What's the matter with the shoes I'm wearing?" he asks in the video. "They're red, black, and white." The latter comment suggests that the guy actually picked his FUBU sneakers to match with the KKK's color scheme. So not only is he a bigot, but he's also the type of guy who needs his whole outfit to match.